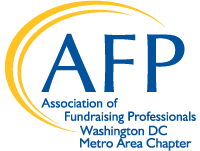 AFP DC is the only organization in the Washington, DC metropolitan area committed to the professional development of all fundraisers, regardless of industry or sector. We foster a vibrant philanthropic community through the delivery of cutting-edge educational resources — including our Bridge Integrated Marketing & Fundraising Conference — peer-to-peer learning and engagement opportunities and accreditation training. Join our growing community of more than 1,000 fundraising professionals to learn about industry best practices from seasoned experts, expand your personal network and advance your organization’s mission. CLICK HERE to learn more about the different membership categories and pricing. We believe shared practice informs best practice. Despite the inherently competitive nature of philanthropy, developing shared practice among the Washington, DC metropolitan area fundraising community is the absolute best way we cultivate philanthropy. By facilitating cross-sector learning, we are creating a regional fundraising community that advances big ideas. We believe in the power of diversity and inclusion. The diverse causes, sectors and affinity groups reflected in our membership are among our greatest assets. Creating opportunities for individuals with common areas of interest yet diverse backgrounds to convene and network is one of the most valuable benefits we offer our members. We believe the ability to adapt is key to our success. As philanthropy evolves, so too must our approach to fundraising. We know we cannot simply do what we have done in years past and expect to achieve the same results; new challenges must be met with innovative solutions. We help our members respond to the latest trends in philanthropy, leverage new technological advancements and target new and emerging markets. Stay up-to-date on the latest trends in philanthropy and cutting-edge fundraising best practices. Give back to the fundraising community. Find your next career opportunity or client. Learn how your organization can navigate the changing philanthropic landscape. Equip in-house fundraisers with the tools they need to cultivate and maintain donor relationships. Ensure your organization’s practices adhere to ethical standards. Adopt proven fundraising strategies employed by organizations of similar size and scope. We help grow our members’ professional networks by creating opportunities for them to meet and learn from hundreds of diverse fundraising professionals throughout the region. Through our affinity groups, we create opportunities for members to connect with peers from similar backgrounds. We share industry-wide best practices, tools and techniques from philanthropists and experts through our robust calendar of educational events and webinars. We are the largest organization committed to advancing fundraising professionals in the Greater Washington Metropolitan region. We recognize outstanding achievement among fundraising professionals and volunteers as well as individual, foundation, and corporate philanthropists. We are the “go-to” organization for philanthropists in the Washington, DC metropolitan area. We advocate for members to AFP International.